LAKE BUENA VISTA, Fla. — Philadelphia Union’s search for their first victory over Orlando City SC still goes on. Corey Hertzog gave the Lions the early lead in the 31st minute, after he chipped the ball over Union goalkeeper Zac MacMath, however, Leo Fernandes’ strike in the 73rd minute helped the MLS side to a 1-1 draw at the ESPN Wide World of Sports Complex on Wednesday night. “We got a long way to go, we turned over the ball too quickly in very dangerous positions, it looks like we haven’t played in a long time,” said OCSC head coach Adrian Heath. “We have a lot of work to do, but I can’t fault them, terrific effort. It was a fair result. Heath opted to start his MLS signings Yordany Alvarez, Darwin Ceren and Kevin Molino in the midfield, which proved to pay dividends in the first half since it created various scoring opportunities. The match was also Molino’s first game back after he was out of the country working on a work permit. Maurice Edu almost gave the Union the opener in the 25th minute, when his shot toward the top right corner of the net was punched out by Orlando goalkeeper Miguel Gallardo. The Lions were able to find the opening goal in the 31st minute when Luke Boden’s pass found the former Red Bull, as he chipped the ball over MacMath for the 1-0 lead at halftime. 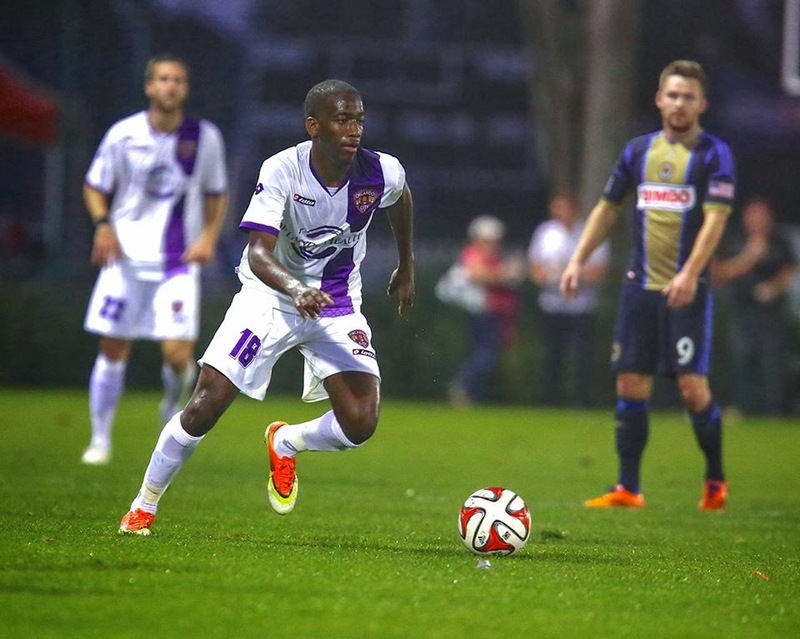 In the second half, Heath substituted Hertzog out for Dennis Chin, while James O’Connor came in for Yordany Alvarez. OCSC could of doubled the lead in the 56th minute when Molino found Austin da Luz in a through pass, leaving the keeper to beat but only failing after the ball hit the post and Chin missing wide on the rebound. Despite failing to double the lead, the Union leveled the match in the 73rd minute after second-half substitute Leo Fernandes shot an unassisted dead ball from outside the 18 yard box, which deflected off defender Rob Valentino’s shin for the 1-1 tie. Chin would miss a chance to give the Lions the lead again several minutes later, after he beat second-half substitute goalkeeper Andre Blake, but missing as the ball hit off the goal post.